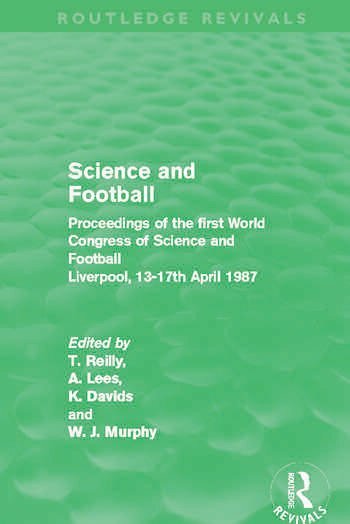 First published in 1988, this book contains edited and revised papers presented at the first World Congress of Science and Football. Held under the auspices of the International Council of Sport, Science, and Physical Education, the Congress was a unique gathering of international scientists researching into football and practitioners professionally involved in the many football codes. American football, soccer, rugby league, rugby union, Australian rules, Gaelic football and national variations of these games are all covered in depth, in both amateur and professional systems. Nutrition, biomechanics, equipment, physiology, sociology, psychology, coaching, management, training, tactics, strategy are among the main subject areas the contributors cover. With over 22 countries represented and with players, managers and coaches involved as well as academics the book represents a truly international, comprehensive and practical picture of contemporary football.